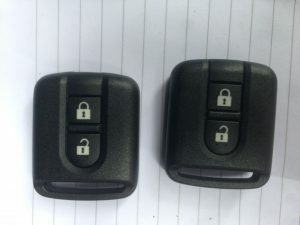 Replacement Nissan Keys Essex. 07708759815. Emergency 24 Hour. ave you lost your Nissan Keys in Essex? Have you Locked keys in your Nissan? At Nissan car Keys, we can help. We are a small family run business, we cover the entire region of Essex and surrounding areas. Our locksmiths have experience in all types of Nissan vehicles from the Early Nissan Micra to the latest Nissan Navara Trucks. We offer our services from a basic spare standard key, also Remote programmed keys to the more advanced intelligent keyless systems. Ours vans are fully stocked with the latest car key cutting machines and the Latest advanced car key Programmers. Here at Replacement Nissan keys Essex. We offer a no fix no fee policy as we are confident in being able to complete the job. Our family offer a 24 hour emergency assistance with a local locksmith based near you. This not only helps us to respond quickly but keeps the costs down for you the customer. As we are mobile emergency locksmiths we can either complete the work at your home. Or at the roadside if you are stranded whilst out on your travels. This saves you time but also the costs associated with getting your vehicle to the main dealers. One of the jobs completed by replacement Nissan Keys Essex recently was a 2002 lost Nissan Micra Key in thurrock in Essex. The cafe owners from Tilbury Essex were out shopping at lakeside where the car keys were lost. These can be a difficult key to program as this model was an intelligent remote Key. This type of system not only requires a pin code, but expensive key programmers, to complete the job. So if you have Lost your Nissan keys, Locked your keys in your vehicle or simply require a spare key for your Nissan?our experienced Nissan Locksmiths can help. Call Dean Now on 07708 759815 for free estimate and advice.